My account of foraging, growing and cooking fresh, local, seasonal food. What's in the hedgerow now? "Take Medlers that be rotten, and stamp them, and set them upon a chafin-dish with coales, and beat two yolks of Eggs, boyling till it be somewhat thick, then season it with Sugar, Cinamon and Ginger, and lay it in paste. Being baked scrape on sugar." So that's what I did. Simple. What? More explanation you say? Do you really think it's needed? The above is Robert May's Medlar Tart recipe from 1660. As you may remember I got hold of some Medlars earlier in the year and made Medlar 'Fudge' (which I have since re-christened Medlar Medley) at the time I also came across this recipe on the 'net. The original URL now seems to be broken but thankfully I had copied it into a word document. As I now have several jars of Medlar Medley to use up I thought I'd experiment a bit to make a Medlar tart. I'm blogging it mostly because it's an interesting exercise to try and use a 300+ year old recipe rather than out of any expectation that anyone may actually rush out and copy it. The basis of the recipe seems to be a puree of the medlars mixed with eggs, sugar and spices. 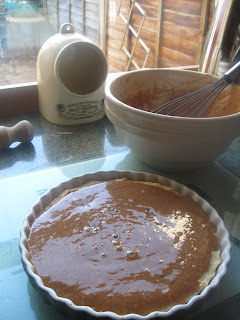 'Laying it in a paste' apparently means to put it in a pie shell so the recipe now begins to look very similar to a modern American pumpkin pie, which I looked to for technical details like cooking times and temperatures. Roll out the pastry and line a greased, floured baking dish. Prick the bottom with a fork and brush with beaten egg (this can be taken from the eggs used in the main tart recipe) Bake at GM 5 for half an hour. Meanwhile mix the Medlar, eggs and evaporated milk together to make a pourable mixture. When the pie shell is lightly browned, fill with the Medlar mixture and bake at GM 4 for a further 40 minutes, or until the filling has set. Serve warm with cream or ice cream. To be fair, the finished tart is not a thing of beauty being, as it is, filled with brown sludge. However, the flavour is there is spades, spicy caramel with a strong, fruity, Medlar tang. At the risk of sounding a complete ponce, it's a privilege to experience a taste of the 17th Century. Any recipe which begins with stamping on rotton fruit makes me nervous! I don't really get this 'meddlars' thing...the rotten fruit really puts me off...an I really don't know what the 17th century tasted like?!?!?! Oh that made me laugh, safe to say you're not a fan then? I think your good just interrupting the recipe, I had no idea what it was on about. The fruit are not rotten, they are bletted. The 'rotten' thing is quite mistaken, just think of them as over-ripe, they are nice to nibble on while doing autumnal tidying up outside. We've made medlar butter in the past, it has a lovely flavour, and now that I have 2 trees fully laden I really should try harder to find nice ways of using them. Treasures at the Bottom of the Freezer. Momentous Day in the Kitchen. We rear pigs, we're in the Waveney Valley, we're a Club.